This second novel from the author of The Piano Teacher takes us back to Hong Kong and into the lives of three American women living in the expat community. Mercy, a young woman adrift after an incident that has left her paralyzed with guilt; Margaret, a wife and mother whose family has suffered a terrible loss; and Hilary, who longs to be a mother even as her marriage stagnates. The third-person narration moves between characters, and we see them being pulled toward one another as the story develops. Unlike many novels, this one thankfully does not move back and forth in time, but instead contains flashbacks to earlier times, most notably to what is referred to as "the incident." Watching these three women change and grow throughout the novel was incredibly satisfying. Each held an emptiness within herself and couldn't manage to fix it or move past it. Each was imperfect in some way, denying realities, making bad choices, or unable to make any choices at all. But by the end they all evolved into people who could clearly see what they needed to do, and who could put aside their differences and be there for others who needed them. It was breathtaking. Lee's writing is lovely and atmospheric and I savored every bit of it. It wasn't especially heavy on description, but somehow transported me with its simple quiet perfection. One of my favorite parts was the description of the apartment Margaret rented just to have a place of her own, where she would go and take long luxurious baths. Having visited Hong Kong, it was also fun to recognize the touristy town of Stanley, breakfast spot The Flying Pan, and the post-SARS obsession with disinfecting everything. The expat community appeared in quite an unflattering light, which made me wildly curious about the reality even while I was entertained and horrified by these shallow, materialistic people in their insular community. I loved Lee's first book, The Piano Teacher, and recommend it to library patrons all the time. Janice Y.K. Lee is an author who deserves to be more well-known than she is. 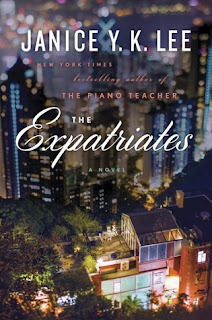 I have been so excited for The Expatriates since I heard about it a few months ago and I'm so glad that it is just as good as her first novel. I look forward to recommending it often!